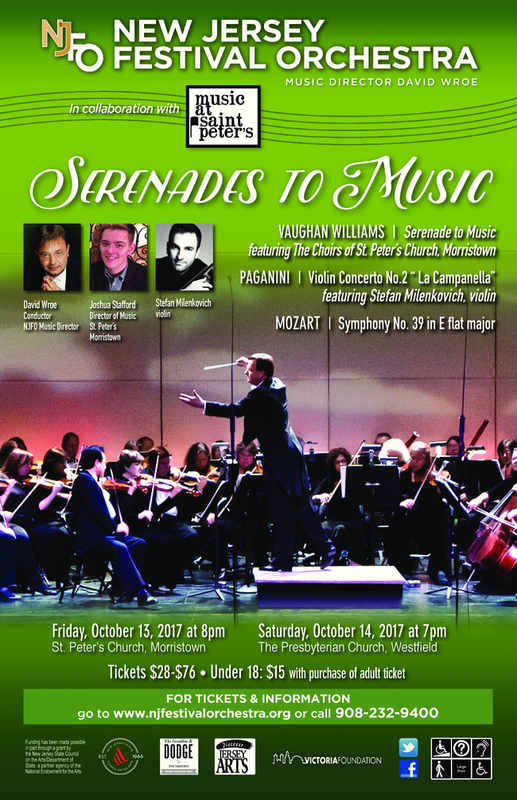 The choirs of St. Peter’s, Morristown join NJFO to present Vaughan Williams’ Serenade, a shimmering musical work inspired by William Shakespeare’s contemplation of the beauty of music. ﻿Hailed by the New York Times as "a true virtuoso," internationally acclaimed violinist Stefan Milenkovich brings to life Paganini's B minor violin concerto, one of the most dazzling scores ever created for the instrument. Mozart's sublime 39th Symphony—a Champagne-like sparkling masterpiece—will bring the season opening celebration to a delightful and energetic close.